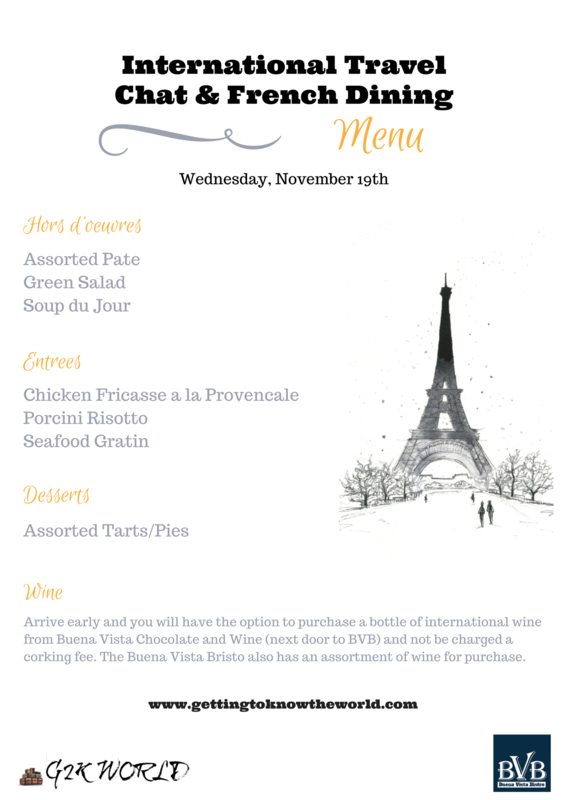 Walking into Buena Vista Bistro was like being transported directly into a bistro on the Avenue des Champs-Elysees. The mural in the bistro is reminiscent of a night in Paris with the Eifel Tower in the background. The pate was divine, the Chicken Fricasse a la Provencale was tender and savory, the Porcini Risotto was perfectly rich and creamy, as you would expect with French dining and the tarts were so very sweet, buttery and flakey. 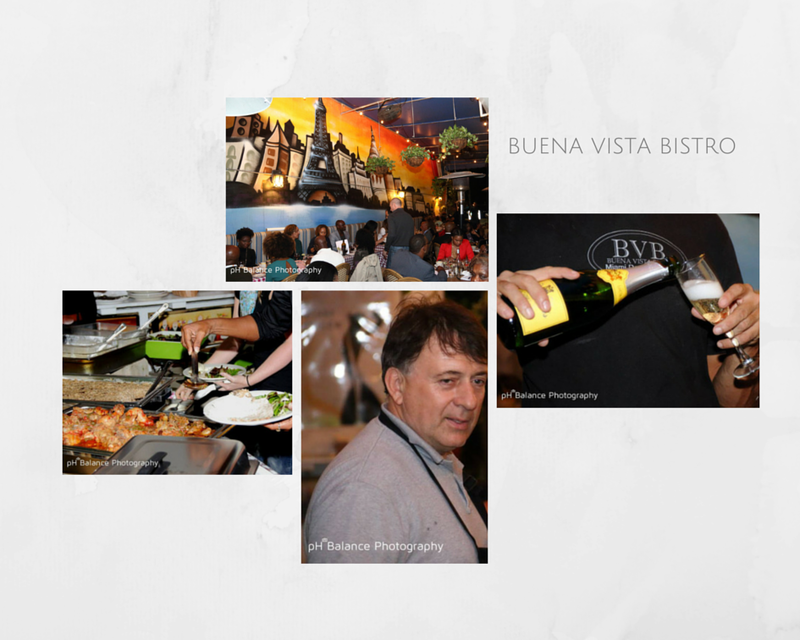 And when you add Buena Vista Bistros’ owner Chef Claude Postel giving everyone details about the food with his lovely French accent, the champagne and wine, samples of divine chocolate and French music in the background you couldn’t help but get swept away in the moment. 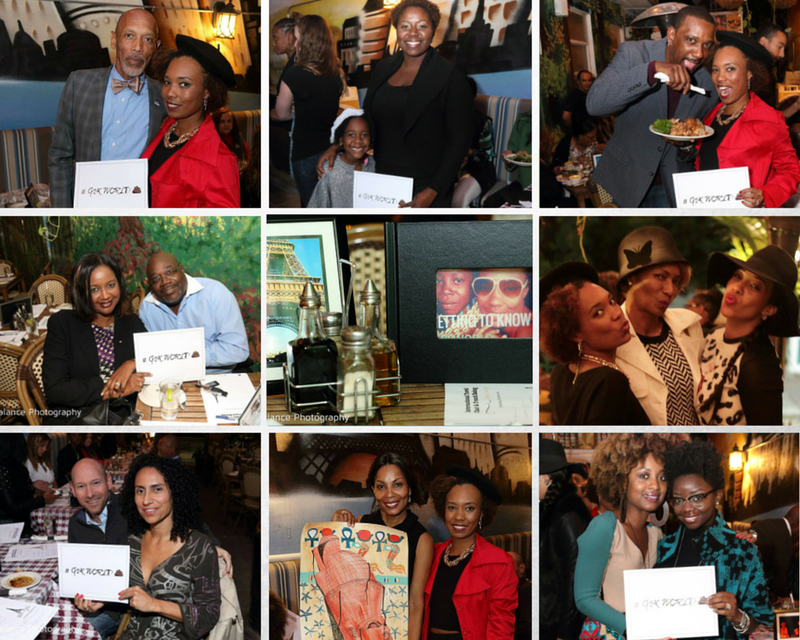 The evening began with guest mingling with each other and sharing their stories about travel. The energy at the Bistro was fantastic. Later I introduced myself and the guest to why I was hosting the G2KWorld Travel Chat and Dining – I’d traveled around the world for the past 3 years and want to share my experiences with people and want other people to have a place to share their experiences as well. I also explained how I started living abroad. Guest completed a travel questionnaire, which encouraged everyone to make lists of the places they’ve been and talk to each other about their personal adventures abroad. There was a guest that had visited over 150 countries, someone who got their scuba license in the Cook Islands and an adorable 6-year-old who can’t wait to get to Paris!